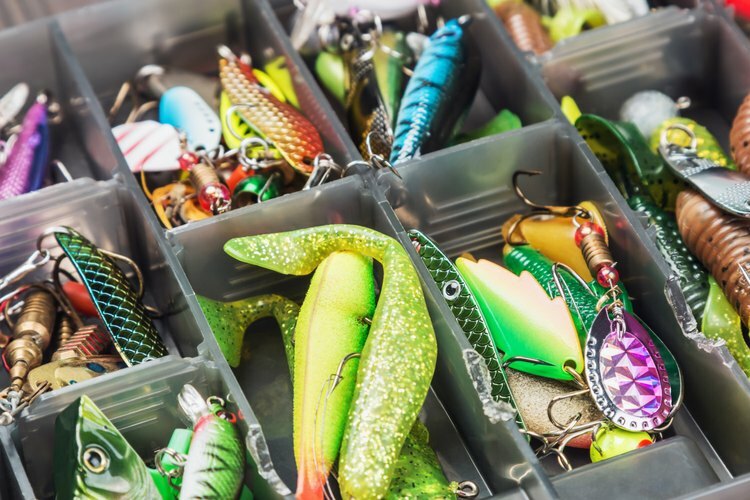 Fishing lures and accessories in a tackle box. When fishing for bass, whether largemouth, smallmouth, spotted or peacock bass, there's nothing quite as exciting as watching a big fish smash into a top water lure. These lures are specifically designed to float and are constructed to make a noise when worked through the water, attracting bass in the area to the commotion. Every bass fisherman should have at least a couple of good top water lures in their arsenal. Popper and chugger lures have a leading tip that is concave and cup-shaped. The shape creates a chugging or popping sound, which attracts bass. Usually worked through the water with sharp, jerking motions, they can also produce plenty of action with a straight retrieve. The sound can be detected at greater distances than other lures. Among the most famous of popper lures is the Jitterbug by Arbogast, which has been around for over 50 years and uses an aluminum shield to produce its unique popping sound. Other chuggers and poppers include the Storm Rattling Chug-Bug, the Rebel Pop-r and the Rapala Skitter Pop. Jerk baits come in a variety of shapes and sizes and are frequently weighted lightly to be used as a top water lures. These long, streamlined lures are often worked in a pattern known as "walking the dog." From above, this action looks like a zigzag pattern, moving first in one direction, then quickly in another, producing a more lifelike action. Jerk bait lures usually sport two treble hooks. The Zara Spook and Mirr-O-Lure TopDog are good examples of top water jerk baits. It's difficult to mistake a buzzer or prop bait for any other type of lure. These lures have tiny propellers, often mounted at both the nose and tail of the lure. These propellers spin while the lure is being retrieved, producing a buzzing sound that can attract bass. Buzz baits, made of spring wire and possessing larger flashing props and plastic skirts can also be worked as a top water lure, when retrieved quickly. The tried and true Heddon Torpedo is an unmistakable prop bait. Hybrid lures combine properties found in other top water lures. They may have propellers, as in buzzers and prop baits, and may also have a nose shaped to produce a splashing sound similar to that of a chugger or popper. For a good example of a hybrid top water lure, check out the Johnny Rattler from Luhr Jensen. Soft plastic lures in the shape of frogs have been around for a long time. These lures are designed to float and mimic the swimming action of real frogs and are commonly worked across lily pads and other vegetation. They may resemble real frogs or may simply appear as a stylized frog. Frog lures usually have curved, double hooks that lie close to the hollow body of the lure. When a bass strikes, the lure collapses, exposing the hooks.